A survivor of domestic violence and post-traumatic stress, Sakura is now using her Live Your Dream Award to become a licensed health nurse to serve other survivors and eradicate abuse. When Sakura Kishikawa*, from Japan, called a support center for women and children, she was confused and could not find the words to describe the situation in which she found herself. Sakura married her husband because she trusted him, and she wanted them to spend the rest of their lives together. But soon after they married, her husband became a different person, and started to abuse her physically and mentally, and deprived her of her economic freedom. She wanted to run away and leave this dangerous life behind, but she felt this was impossible. The constant stress Sakura felt caused her to become physically sick. She suffered from heart palpitations, nausea, as well as dizziness and hearing loss. After deciding that both she and her son deserved a better life, she confided in her parents about the abuse, and made the difficult decision to divorce her husband. Sakura began counseling to deal with her stress. Hearing about the experiences of other women who have experienced domestic violence helped her realize she is not alone. This has motivated her to devote her life to eliminating domestic abuse. “My dream is to eradicate abuse, domestic violence, and sexual violence and to create a society in which women can live with dignity,” Sakura says. Unless we eradicate violence from society, the rights of women and children will not be protected and we cannot hope for women to advance. Sakura currently balances raising her young son with studying to become a licensed health nurse. As a nurse she wants to visit families with cases of domestic violence and child abuse, and identify victims at the early stages. Sakura is steadily recovering from the trauma of her abusive marriage. She even worked up the courage to ride the train! Sakura continues to suffer from insomnia and dizziness, but she doesn’t let it stop her from applying herself fully to both her academics and her son. For example, one result of her stress was a fear of riding the train. 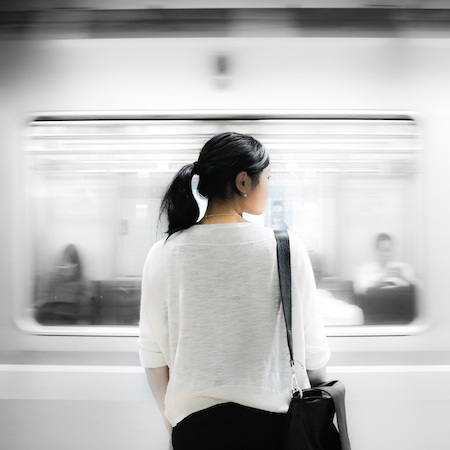 When she wanted to attend a training to become certified in educating about domestic violence and dating violence, she overcame her fear and took a train to the center of Tokyo and obtained her license. As a federation recipient for the 2014-2015 Live Your Dream Award, Sakura will use the money to pay for her living expenses and school tuition. She then plans to start building a network of like-minded people to start realizing her dreams of establishing a center to stop sexual and domestic violence. I somehow survived the hardship and am still alive today. By becoming one of those who can understand and help the victims, I can look back and be proud of my survival and grow as a person.